If you are in the DC, Northern Virginia, or Southern Maryland areas (or have any general desire to travel there! ), please join us in taking a stance against occupation, the apartheid wall, colonization, the siege of Gaza, warmongering against Iran, and unconditional U.S. support for Israel by protesting Christians United For Israel (CUFI)'s annual summit in DC. (Read more about this rally in the "action alert" at the bottom of this blog posting or click here.) This rally will be taking place on July 21, 6pm, at the Convention Center in front of the Mount Vernon Place entrance, where the summit is being hosted. (This is off of the Convention Center and Gallery Place metro stops; the address is 801 Mount Vernon Place Northwest). 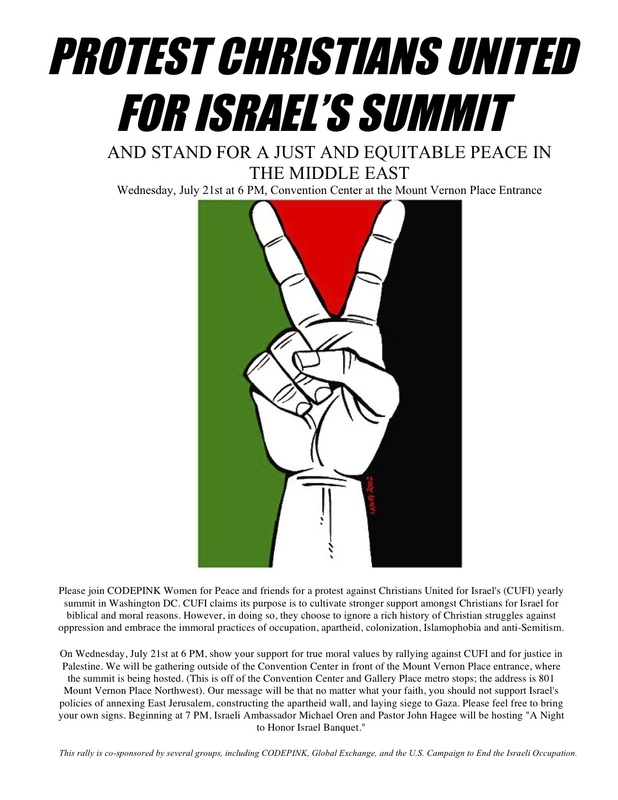 We are planning several days of actions, including an Interfaith Press Conference across the street from CUFI's summit, to work for a just and equitable peace in Palestine/Israel and for a new U.S. approach to Middle East policy! Walk around your neighborhood and put some fliers up in key spots: cafes, on lamp-posts, community billboards, and more. Hand them out at any concert or other event you're going to over the weekend. Hand them out to to your friends, family members, co-workers, and others. And I'm sure you can think of additional ways to circulate this flier. 2. Copy and paste our action alert about this event into an e-mail and send it to your friends, allies, family, co-workers, and other contacts - and then ask them to send it along to their contacts! (The action alert can be found at the end of this blog post or by clicking here). 5. Send our press release to any local news outlets, blogs, or other media you know! (The text of our press release is included at the bottom of this blog, which you can copy and paste into an e-mail). Of course, you aren't restricted to doing only one of these! Thank you so much, and we look forward to standing with you on July 21 at 6pm in front of the Mount Pleasant entrance of the Convention Center. Mac: Click the image to take you to the full document. Hold control + click on the image. Choose "Save Image As." Then open it and print! PC: Click the image to take you to the full document. Right click on the image. Choose "Save Image As." Then open it and print! Please join CODEPINK and friends for a protest against Christians United for Israel's (CUFI) yearly summit in Washington DC. CUFI claims its purpose is to cultivate stronger support amongst Christians for Israel for biblical and moral reasons. However, in doing so, they choose to ignore a rich history of Christian struggles against oppression and embrace the immoral practices of occupation, apartheid, colonization, Islamophobia and anti-Semitism. On Wednesday, July 21st at 6 PM, show your support for true moral values by rallying against CUFI and for justice in Palestine. We will be gathering outside of the Convention Center in front of the Mount Vernon Place entrance, where the summit is being hosted. (This is off of the Convention Center and Gallery Place metro stops; the address is 801 Mount Vernon Place Northwest). Our message will be that no matter what your faith, you should not support Israel's policies of annexing East Jerusalem, constructing the apartheid wall, and laying siege to Gaza. Please feel free to bring your own signs. Beginning at 7 PM, Israeli Ambassador Michael Oren and Pastor John Hagee will be hosting "A Night to Honor Israel Banquet." Sorry! This content is coming soon! Please check back shortly!